When you send flowers, it's a wonderful thought... yet you have to find a vase, prep the flowers, find a spot for them, change out the water and clean up their mess when they die. Send flowers that require no clean-up and never die, create a card that embodies Spring and how wonderful someone is to you! This quick, pretty, fun card is easy to make and will deliver a ton of smiles. I'm so very excited about the new In-Color Collection in our New Catalog and Idea Book. These rich, elegant colors will be a MUST-HAVE in YOUR Collection, too!! 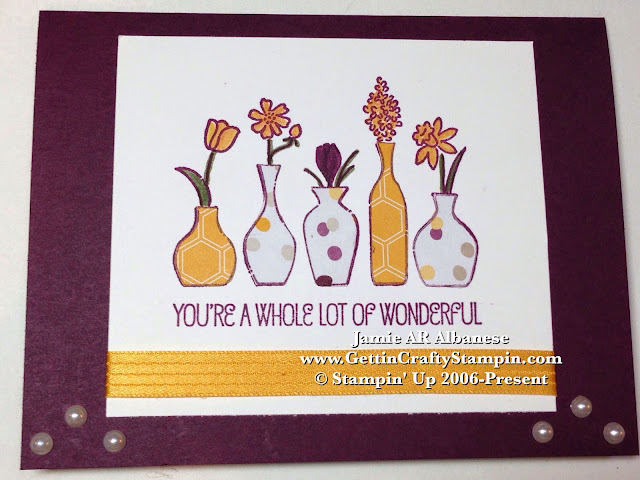 Simply stamp this Vivid Vase stamp on Whisper White card stock with the Blackberry Bliss ink pad. Do the same on a sheet of the new (and must have) Moonlight Designer Series Paper Stack (I love that they are cut to travel and in a book for easy use). Here I stamped the image on the front and back and cut out the vases using my precision cutting Paper Snips. Apply them on using an alternating pattern with the SNAIL adhesive. 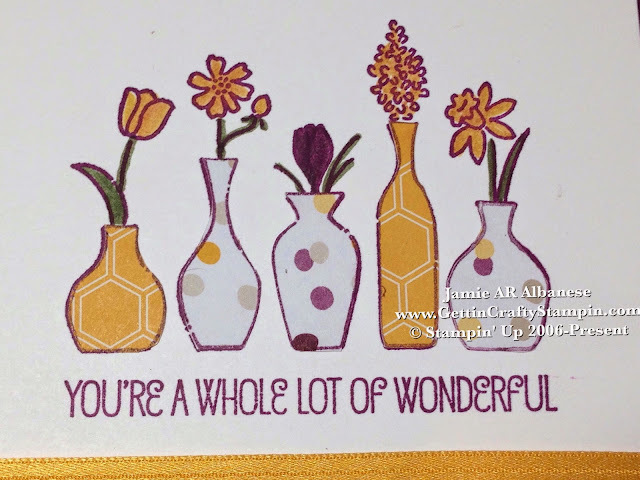 Color in the flowers with the In-Color Stampin' Write Markers for a coordinated look. These new, rich colors are sure to delight!! Wrap it up - add a pretty, color coordinated ribbon to this card with the stunning and new Hello Honey Stitched Satin Ribbon. It's so pretty!! Adding these pretty adhesive backed Pearl Jewels for a pretty accent to the card. Send a lovely collection of flowers that require no maintenance and show that you care!! This quick, cool, fun and easy card will brighten the day of someone special in your life. 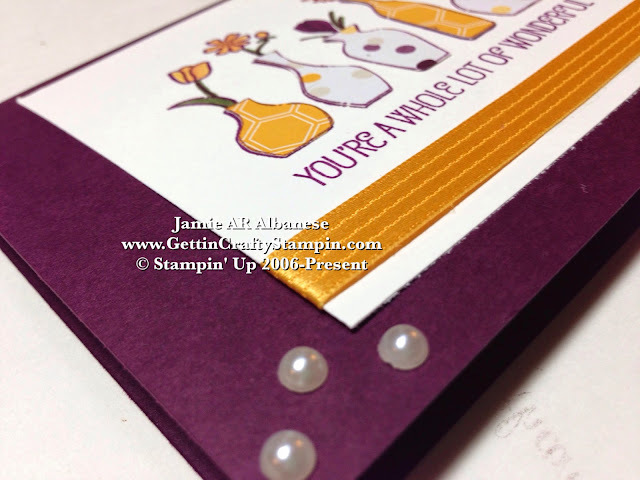 JOIN ME in creating beautiful cards with the NEW Stamps, papers, colors, tools and more at the Upcoming Preview Party and Card Class or BOOK a Private Class and Earn these New Products for FREE as the Hostess!